As much as I love cooking, there are times when I just could not be bothered. Long days at the office, being focused, driven and cheery, while secretly wishing I was in the bath with a good book and a bottle of red, can be a sometimes be an inspiration drain. And don’t even get be started on the post-work supermarket free-for-all, some days I’d rather go hungry than face into that. My poor Dad also seems to suffer from the same lack of culinary creativity. It’s his job to make the dinner on a Monday night (which, in fairness, is probably the most insipid of all the weekday nights); and so for the past 30 years he has made chili beef. Religiously. Every Monday. Now, don’t get me wrong, I like chili beef just as much as the next person. It’s just that after 30 years of it; I find it, well, not quite as exciting as it once was. Obviously I don’t get to spend that many Monday evenings with my folks, what with living on the other side of the plant and that. One major upside of which is not being subjected to what has become known in our family as ‘Monday night surprise’. On evenings when I am feeling unimaginative and bored, I just need to open one of Tessa Kiros’ books to get the creative (and tummy) juices flowing. 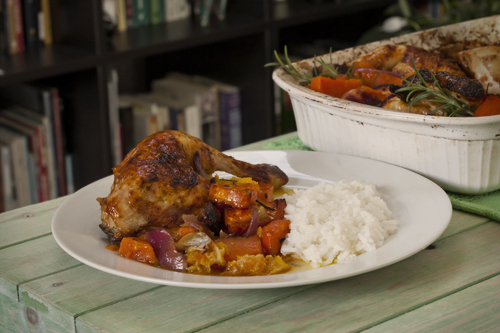 Her recipes are simple, wholesome and comforting and they are just so beautifully presented, I would challenge anyone not to fall in love with them. 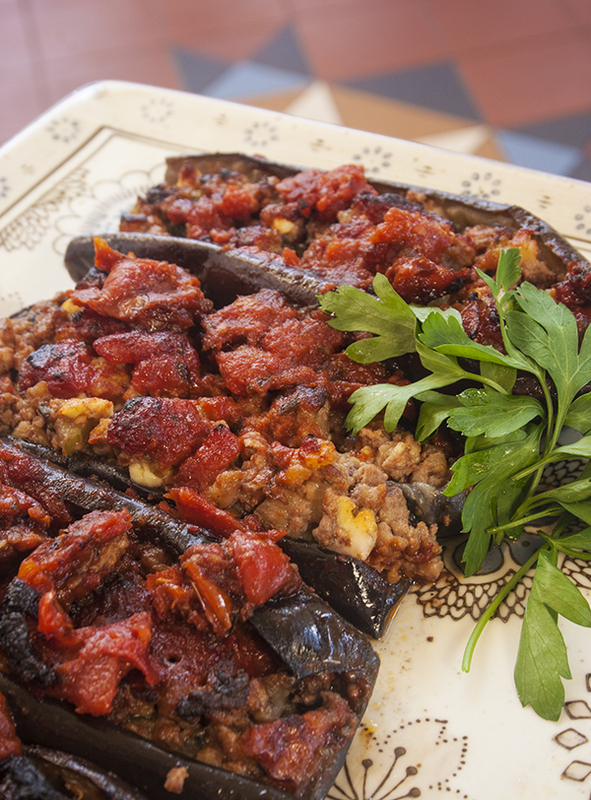 This week I made her stuffed aubergines. Like all of her recipes, these are delicious and filling and a little bit different. Okay, so stuffed veggies ain’t exactly world-rockin’ stuff, but they may just brighten up an otherwise dull and same-y weekday evening. Who knows? Even my Dad might like them. Recently I’ve been thinking about family recipes and how they get passed from person to person. It was sparked by a story I heard about a girl who’s friends put together a scrap book of all their family recipes as a wedding gift, how sweet is that?! Certainly beats a set of towels in my book. My aunt is also a wonderful cook, but I fear she’s quite like me and makes up recipes as she goes along, thereby making it slightly difficult to write them down or pass them on. 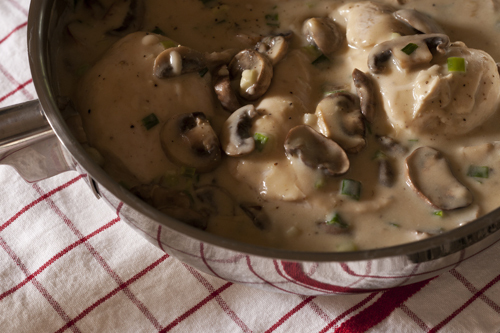 Her stroganoff is legendary; it’s absolutely out-of-this-world delicious! When I was a kid, I loved it so much that whenever she made it, she’d always make an extra plate for me. I have been begging her for the recipe for years now with no luck, although I’m starting to suspect she doesn’t have a clear idea of it herself! 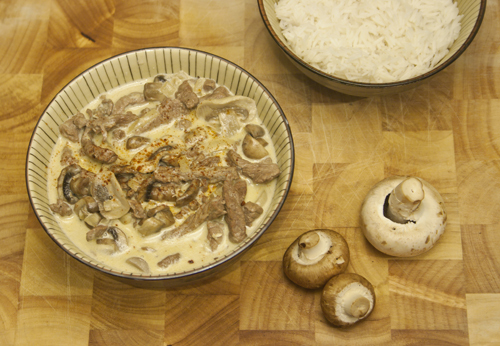 So here is my attempt to recreate my aunt’s stroganoff, but obviously this is subject to change, depending on what we have in the fridge on a given day! Oh dear, I seem to have created an uber-addictive and calorie ridden tour de force. Anyone who is on a diet, please proceed with caution. I’m pretty sure this harmless looking snack contains oh, about 79 bazillion weight watchers points per slice. By all means make it, but when the top button of your pants starts to object don’t say I didn’t warn you. This recipe is from one of The Fella’s cookbooks from back in his bachelor days. It’s a wonder he found a girlfriend at all, given how much he likes this pizza; although I suspect all the faffing about with yeast and dough probably put him off making it too often. 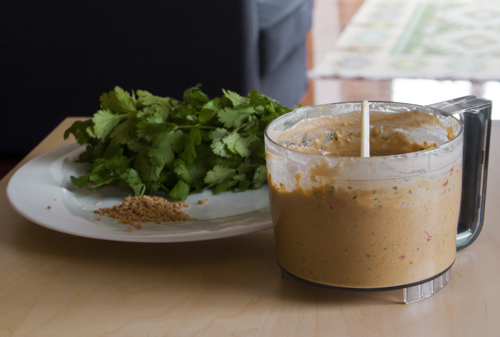 I’ve adapted the recipe and made my own satay sauce, rather then just using a jar. So now I have plenty left over for chicken or prawns or the more traditional satay companions. 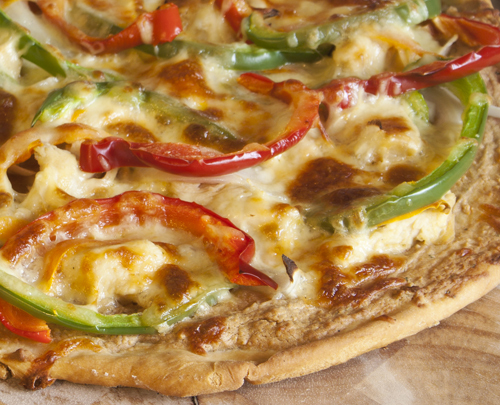 Satay makes a super interesting pizza sauce and this recipe has actually inspired me to experiment a bit more with what I would consider to be stapes in a recipe. I would definitely recommend you chuck the diet out the window, go forth and be adventurous with peanuts! This recipe is for my dad. Dad is usually very adventurous about what he’ll eat, with one major exception: he cannot and will not abide pesto. He was raised on a diet of spuds, cabbage and bacon that bored him to tears; so now he has an appetite for absolutely anything. He has been known to disgust friends and colleagues in posh French restaurants with a penchant for things that crawl on the sea bed (raw, of course). And in college he was affectionately known as Two-Dinners-Dillon. This is a man who likes his food. This all worked out well for him, as my mother is an absolutely cracking cook. However, as a working mother of four, she has, on occasion been known to favour convenience over taste. So when the first incarnation of this strange concoction called pesto arrived on Quinnsworth’s shelves in the late 80s, it didn’t matter that it actually tasted like something an animal might try and bury. No, no in my mother’s eyes it was new, foreign and exciting. And more importantly, it could be poured over a pot of just cooked pasta, meaning dinner for six could be prepared in approximately 14 minutes. Dad hated it and it became known in our house as “The Dreaded Pesto”. Eventually he just boycotted it, which drove my mother mad. And to the best of my knowledge, pesto (fresh or otherwise) hasn’t darkened the door of their fridge ever since. 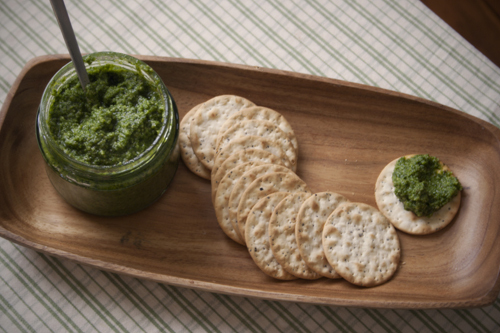 I, on the other hand love love love LOVE pesto. 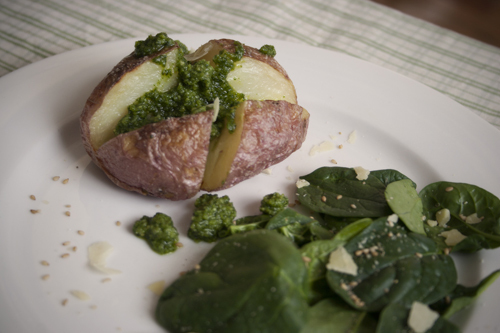 It can be used to dress up absolutely anything, from a plain old cheese sandwich, to salad dressings, to meats; and (my favourite) baked spuds. Limiting it to pasta is just an injustice. This recipe is lovely; it has quite a different taste to basil pesto, not as sweet and with a hint of smokiness from the walnuts. I think it’s what pesto would have tasted like if it had been invented by the Irish. So this one’s for you Dad, one taste and I promise you’ll be hooked! One disappointment I’ve had since coming to Australia has been my experience of the great Australian Barbecue. Now, don’t get me wrong, these Ozzys do love their outdoor cooking, but it’s just not quite as I’d expected. I really should use this information to challenge my stereotypes; as I’m sure the Ozzys appreciate hearing ‘throw a shrimp on the barbie’ about as much as I welcome idiots saying ‘top o’the morning to ye’. Most self-respecting Ozzy barbecuers have a large gas-powered or electric grill on their patio, instead of the tray of smoking, glowing coals that we’re so fond of on the annual three days of Irish summertime. And I can see why they do; it’s simply easier to control a grill. You’re less liable give your friends salmonella with pieces of charred chicken that are still raw on the inside, or turn a sausage into a weapon, or transform a nice juicy steak into something you could wear on your feet. But really, isn’t that really half the fun?! 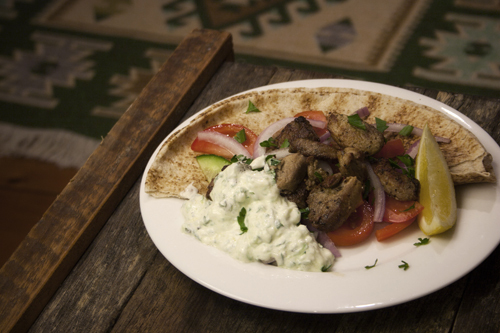 So, anyway, the point of all this is, I found this recipe for souvlaki, which are meant to be cooked on a barbecue. Not actually owning a barbecue, I opted to cook these on an electric grill (albeit an indoor one). And although, I know this was unauthentic, they still tasted soooo good. I know many many Greek people are probably cursing my existence night now, but in my defence, I was excited to try these and simply couldn’t wait until summer. But once it does come around, I’ll cook them again, on a proper, smoking, coal barbecue and I’m sure they will taste even better again! It’s actually a bit bizarre that in the few months I’ve been writing this blog, I’ve never posted any pasta dishes. The Fella and I eat a LOT of pasta, mainly because it’s cheap (his thumbs up) and quick (my thumbs up). Because don’t you hate it when you’ve had a long day at work and you’re faced with the stupid what to make for dinner dilemma? I don’t know about the rest of you, but sometimes I find weekday evenings frustratingly short. Some evenings I just want something quick and easy and I don’t like only sitting down to my dinner at 9 o’clock at night. For one thing, that’s when all the good shows start. Hence, pasta it is. You would not believe the number of “pasta surprise” recipes we have, The Fella is especially good at these. Basically they consist of whatever we have in the fridge, and thus they are great for avoiding a condition called postworksupermarketrage. This dreadful disorder is particularly prevalent among 20 and 30 something childless professionals, who use their weekends for getting drunk and other irresponsible frivolities and neglect to do basic household tasks, such as shopping. Tut tut tut. 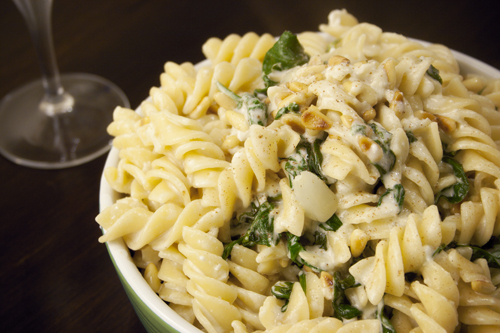 This is a wee step up from pasta surprise, and it is a little beaut of a recipe. 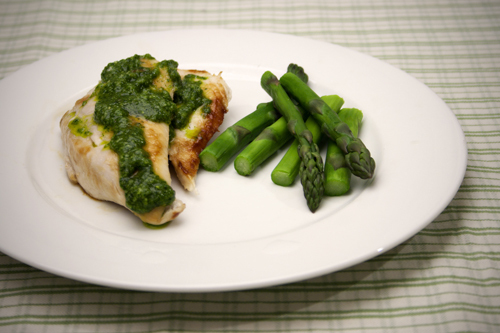 I found it in Nigella Lawson’s Kitchen, and I guarantee you can get this on the table in 20 minutes flat. Beat that Jamie Oliver! Like all of my fellow countrymen (and women), I enjoy the odd spud. But then who doesn’t? Spuds are great. They are super cheap and filling (making them a firm favourite during my student days), but they’re also unbelievably versatile. As a famous hobbit once said, you can “boil ’em, mash ’em, stick ’em in a stew” not to mention bake them, gratin then, fry them, ferment them, and the list goes on! Well ladies and gentlemen, this weekend I brought the humble spud to whole new levels of fanciness: I got me a potato ricer. I can just hear my Dad now, saying that it was far from potato ricers he was reared and sure what’s wrong with an ordinary masher and a bit of elbow grease? Well Dad, there’s nothing wrong with that at all. But with a ricer I promise you, you will make the most yumbo, softest, un-lumpy, creamy mashed spuds you’ve ever had in your life. 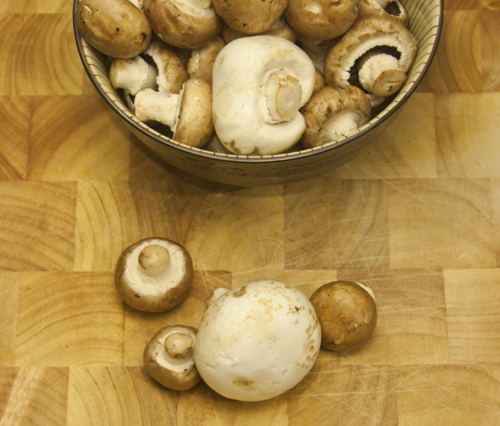 So, then all I had to do was think of something equally fancy to serve with the spuds. I figured beef bourguignon was almost posh enough. The spuds still held their own though, fair dues to them. OK, so I got this book recently and it’s – as we’d say at home – feckin’ deadly! It’s called 700 Forgotten Kitchen Secrets by Darina Allen, and I recommend that everyone goes out and buys it, immediately. I know it almost sounds like I’ve been paid to endorse it. Ha! Wouldn’t that be something? No, I’m just really obsessed with it, so much so, I’ve even considered bringing it to read on the train to work in the morning. But, if sales do sky rocket, Darina you can reach me through this blog. And, I won’t want to be paid or anything, a short spell in Ballymaloe will do me just grand, thanks! Anyways, this book is amazing. It’s full of handy hints, beautiful pictures and great little anecdotes. Reading it makes me want to move home to Ireland and live on a goat farm somewhere on the west coast, making cheese and maybe soap for the tourists. I could keep my own chickens and a cow for milking and maybe even a little hive of bees. Oh, the daydreams I have while trudging through the Sydney underground every morning. Unfortunately, the Fella, having been born and raised here thinks he’s far too cosmopolitan for all that craic. He won’t entertain these notions I have at all, even when I send him pictures of goats being super cute and fun. So, this post will be the first of many recipes from this fab book. I decided to make creamy chicken and ginger, mainly because I already had all of the ingredients and thus didn’t need to leave the house. But also, it’s just a really interesting recipe. Darina recommends letting the chicken soak in milk for about half an hour before you cook it. The lactic acid in the milk works as a tenderiser; breaking down threads in the meat and making it super soft and delicious. This was just too good an experiment for my super-nerdy-chemist-brain to pass up on, and the result: score! I’m not always a fan of chicken breast, but this was lovely and juicy and tender, and not at all dry or bland. Also, the combination of ginger and cream was something I’d never have put together myself, but it works really well. I work full time. My dreams of becoming a yummie-mummie and staying home all day baking fabulous cupcakes and rearing my own chickens will just have to wait until I win the lotto. So, sometimes it’s hard to find time to spend in the kitchen. Much as I enjoy cooking, on weekday evenings it can be exhausting and weekends can sometimes be super hectic. Plus I hate cleaning up, life is just too short for cleaning up. But a few years ago, while flipping through The Guardian, I found a recipe by Hugh Ferning-Whittingdale that changed everything . I duly clipped it out, and boy has it served me well on many a lazy (read hungover) Sunday afternoon. It’s as simple as throwing everything in a roasting dish and popping into the oven, but it tastes as good as if you had slaved over a hot stove for hours. And, there’s very little cleaning up to be done afterwards. Brilliant.